Richard Davis is a shareholder in the Litigation Section at Mesch Clark Rothschild. His practice areas include healthcare and cases that involve products liability, condemnation matters and medical malpractice. He is a fellow of the American College of Trial Lawyers, an elite trial organization in the United States. Richard joined the Air Force after high school and was stationed in Okinawa and at Davis Monthan Air Force Base in Tucson. 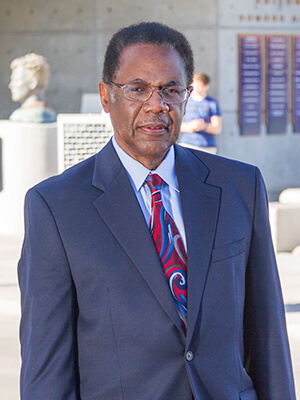 He went on to receive his undergraduate degree from the University of Arizona and his J.D. from the University of Arizona College of Law. He earned a fellowship from the Woodrow Wilson National Fellowship Foundation to attend law school. As a college student, Richard developed the New Start Program, a scholarship program for minorities. He founded the University of Arizona Zeta Theta Chapter of the Alpha Phi Alpha, the oldest African American fraternal organization, and he was the first President of the Black Student Union. He works with Alpha Phi Alpha programs and projects, including the Home Away from Home program, which provides services to students who are new to Arizona; the Go to High School, Go to College program; and the Awards program which honors African American male seniors who have excelled throughout their high school careers. After practicing law for only a year and a half, Richard became the lead counsel defending the City of Tucson in a class action lawsuit. It was the first class action of its kind, pitting aggressive water against defective copper piping. Since then, Richard has tried over 400 cases, representing both public and private entities, including hospitals and municipalities. Alpha Phi Alpha Fraternity,inc .